Pro Football Focus is here to break down the fantasy football players who could surprise or disappoint in Week 10 of the 2018 NFL season. This article breaks down sleepers and busts at every position. To help you understand which players have been making the most of their opportunities from a fantasy perspective — and which teams are giving up the most points — we’re here to bring you the goods. Rivers and the Chargers take on the Oakland Raiders, who have given up the most fantasy points per dropback to opposing quarterbacks this year and are fresh off a three-touchdown shellacking at the hands of former undrafted free agent Nick Mullens, who made his first-ever start. Rivers has at least two scores in every game this year and has an NFL QB rating over 100 in all but one contest. Mayfield quietly had a top-12 quarterback finish in Week 9 against a Chiefs defense that is actually strong against quarterbacks on a per-dropback basis. His Week 10 matchup is much more favorable against the Falcons, who have ceded the fifth-most fantasy points to opposing quarterbacks. Johnson is averaging just 3.2 YPC this season and has only topped 60 yards in a game once. He gets his best chance yet for a breakout game in Week 10 against the Chiefs, who have given up the second-most fantasy points per touch to opposing running backs. The Chiefs have also given up a league-high 634 receiving yards to running backs. This might be the week we finally see DJ pile up the stats on the ground and through the air. Coleman had a breakout game last week with two receiving touchdowns, and he should keep the ball rolling in Week 10 against the Browns, who have given up the fourth-most fantasy points per touch to opposing running backs. The Browns have allowed eight rushing touchdowns against in their last four games. Harris exploded in Week 9 with 10 catches on 12 targets for 124 yards. If Jamison Crowder sits again in Week 10, Harris needs to be in lineups again; the Buccaneers have given up the third-most fantasy points per target to opposing wideouts this year. Gordon has been trending up in New England’s offense, and he’s fresh off his best game yet after dropping 130 yards with a touchdown against the Packers. He could top those stats in Week 10 against the Titans, who have given up the fourth-most fantasy points per target to opposing wideouts. Gordon should see a lot of ex-Patriot Malcolm Butler, who has given up the most touchdowns while in coverage this year (7). Reed has been waiting for a breakout game, and it could come in Week 10 against the Buccaneers, who have given up the second-most fantasy points to opposing tight ends so far this year. Reed hasn’t scored since Week 1, but look for that to change this week as the Buccaneers have allowed tight ends to score against them in five of their last six games. McDonald draws the Panthers defense, which has given up the most fantasy points to opposing tight ends this year and has allowed seven touchdowns to the position in their last seven games. The Seahawks no longer have the “Legion of Boom,” but they have still given up the fourth-fewest fantasy points per dropback to opposing quarterbacks. The Rams are 10-point home favorites, which also means we should see more of Todd Gurley and a little less of Goff. Michel is likely to return in Week 10, but he has one of the toughest matchups from a fantasy perspective against a Titans defense that has given up the fewest fantasy points per touch to opposing running backs. A banged-up Michel still belongs in fantasy lineups given that New England is dropping 30-plus points every week, but expectations need to be tempered. Johnson has the toughest possible matchup for a running back in Week 10, as the Lions travel to Chicago to face a Bears defense that has not allowed a running back rushing touchdown all year. 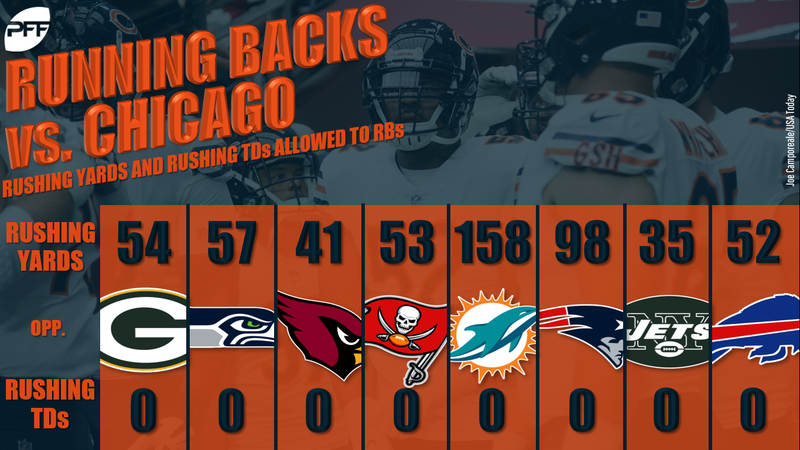 Chicago has also held opposing backfields under 60 rushing yards in six of nine games. Davis is a good buy-low candidate based on volume, but he’ll have a hard time producing in Week 10 against the elite Stephon Gilmore. Gilmore is our fifth-highest-graded cornerback on the year. Hilton will be shadowed by Jalen Ramsey, who is still playing well despite not performing at quite the same highly elite level as last year. Ramsey is allowing just 53% of balls thrown his way to be caught while surrendering just one touchdown on the year. Kittle has emerged as one of the league’s best tight ends, and it’s important to note that his big-play ability keeps him firmly in play every week. But he does have a tough Week 10 draw against the Giants, who have given up the fifth-fewest fantasy points per target to tight ends. 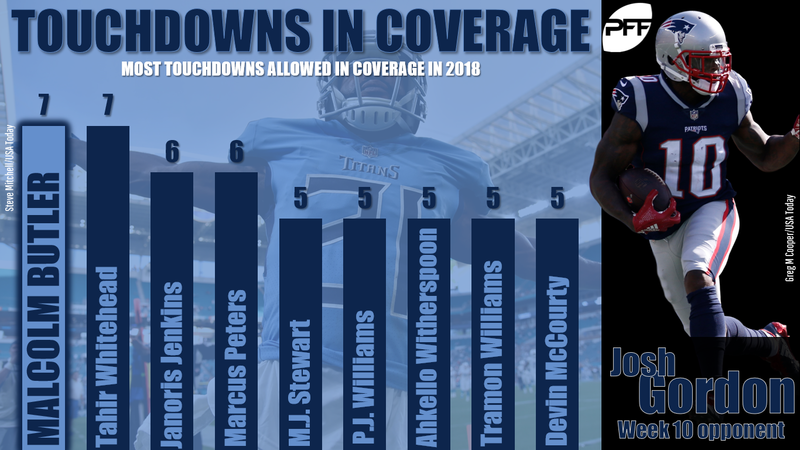 The banged-up Gronkowski will find life difficult against a Titans defense that has given up the fewest fantasy points per target to opposing tight ends this year. Tennessee has held tight ends to fewer than 30 yards in six games this year, including each of their last four. No tight end has scored against the Titans, either.